My first experiments with preserving tomatoes involved burnt fingers, cuts, and a bloody looking mess of tomato waste everywhere that reminded me of that classic Julia Child SNL skit. 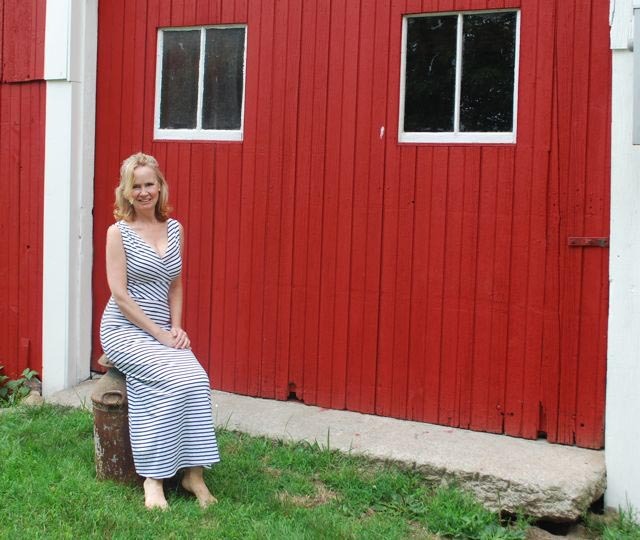 So grab an apron and pretend that you’re a 19th century midwife on the prairie. There’s a lot of boiling water involved. 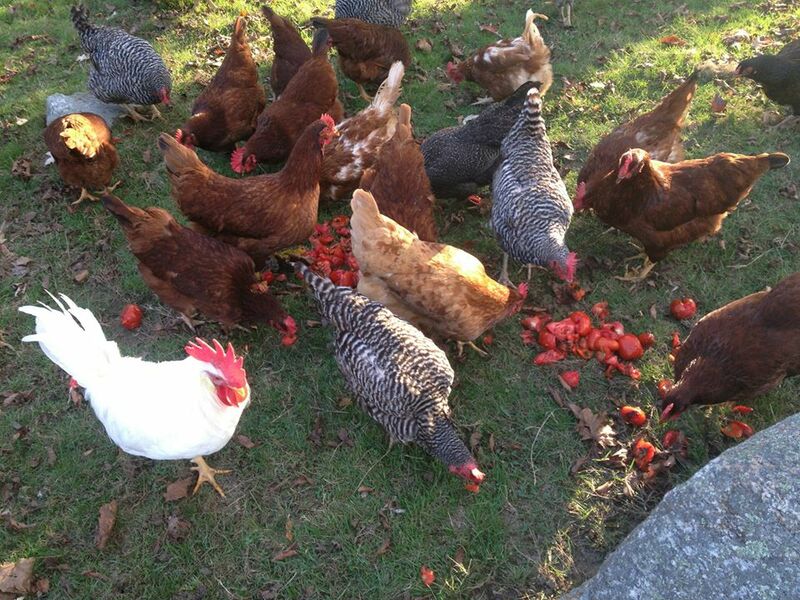 Friends do not let friends seed tomatoes. 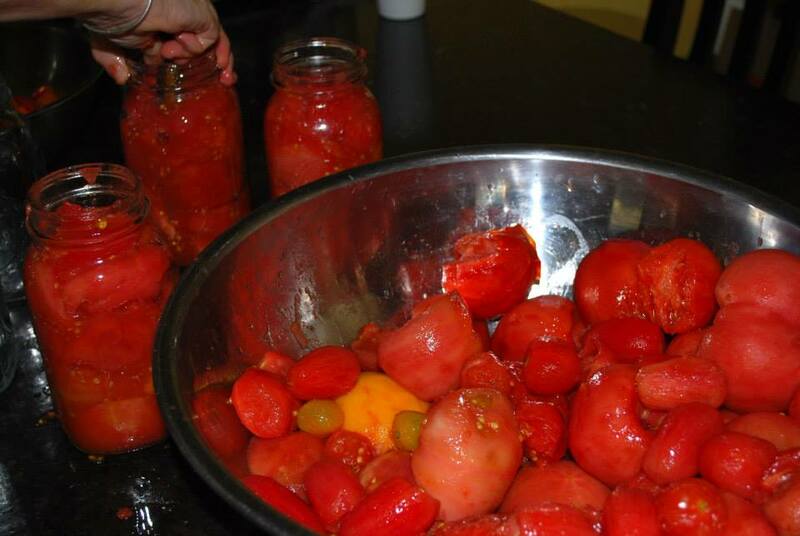 Here are our Five Very Best Tips for Preserving Tomatoes; as well as the Process for Canning and My Very Own Sauce recipe. 1. Buy silicone gloves, which will allow you to submerge your hands into boiling water. Now that is sort of cool just in and of itself. But really you will buy them because hot pads eventually will get soaked through with water and scald you. It’s the best $20 investment you’ll ever make. 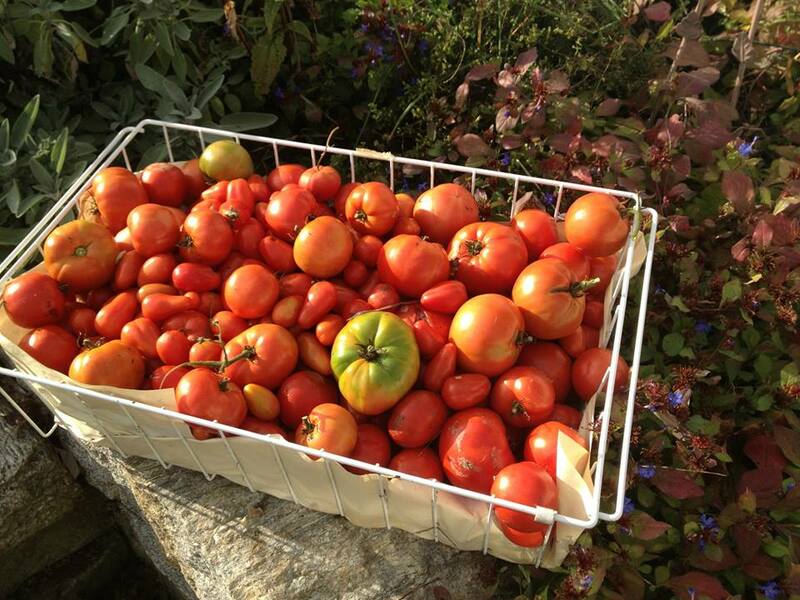 A freezer drawer lined with paper makes a great basket for picking your tomatoes and can be put directly into the freezer. 4. Buy a dehydrator. I spent many years trying to oven roast cherry tomatoes and then packing them in oil in messy freezer bags that I later never used. The tomatoes never fully dried; my oven and my kitchen would ooze moisture from leaving the oven door cracked open. Notwithstanding how good all that moisture might be for your skin, I now dry my cherry tomatoes in a dehydrator. They come out tasting like candy–and for a fraction of the energy cost. And you can dry store them for later reconstituting for soups, stews, and pastas. 5. Do not seed. That’s right. 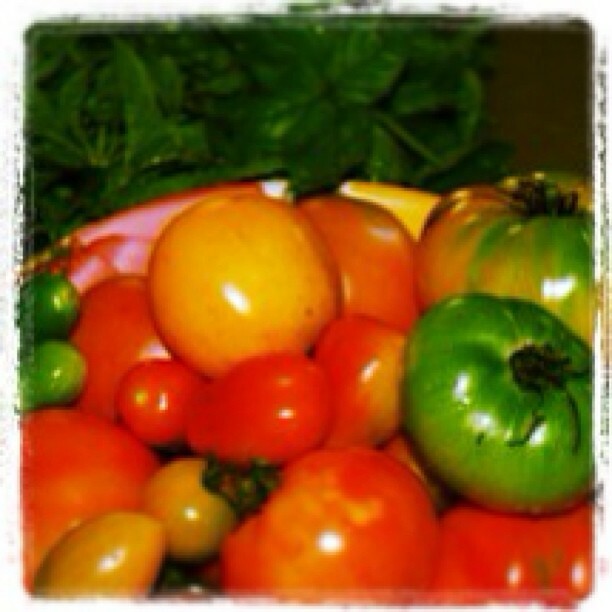 As I said to my dear friend Andy Parker when he was seeking advice, “Friends do not let friends seed tomatoes.” Whew! I bet you feel better. I know I do. 1. Take a large pan (a lobster pot works great! ), put in your wire basket insert for the cans, fill with water to about 3/4 capacity and start it boiling on your power burner. Fill other pans with water to utilize all of your burners and start them on high to boil the water. 2. While you wait for the water to boil, rinse the tomatoes in the shallow pan in the sink. You can pour the water off after rinsing and repeat. 3. Fill the pan in the sink with boiling water to scald the tomatoes. Leave the tomatoes to sit in the boiling water while you do the next step. 5. Now you can pour off the hot water from your pan of tomatoes–which will be ready to peel. Add some cold water to cool them before touching. 6. Peel, core, and cut off any bruises. You should be able to do this with a simple paring knife. 7. 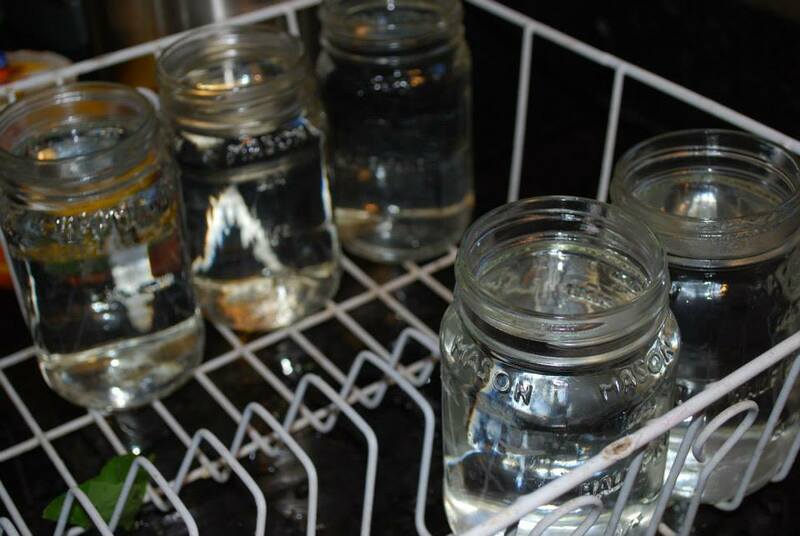 Pour off the water from your sanitized cans and with your clean hands start inserting the peeled and whole tomatoes into your sanitized jars. Press the tomatoes down as you insert more to fill any air pockets. 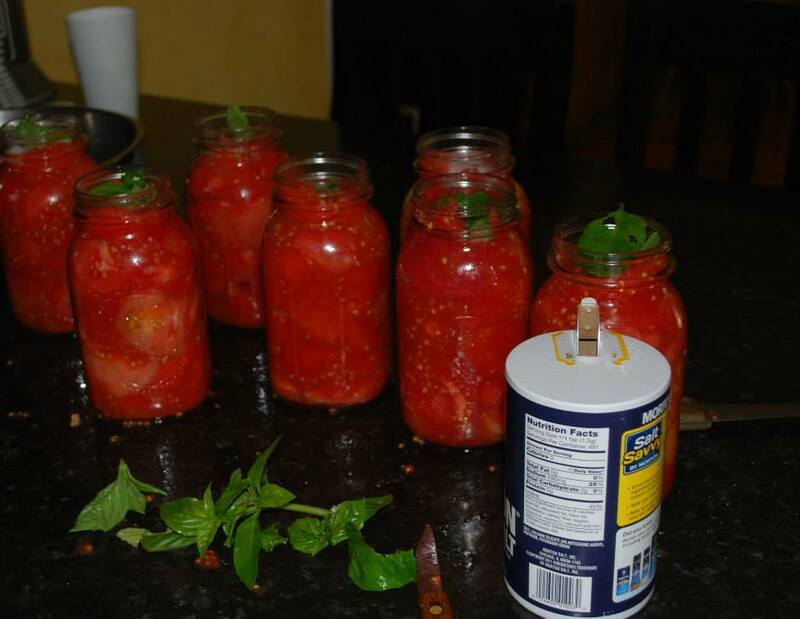 Plunge a knife down the sides of the jars to push tomatoes into any remaining air pockets. Fill to the rim of the can. 8. Finish with a teaspoon of sea salt and a sprig of your herb of choice. 9. 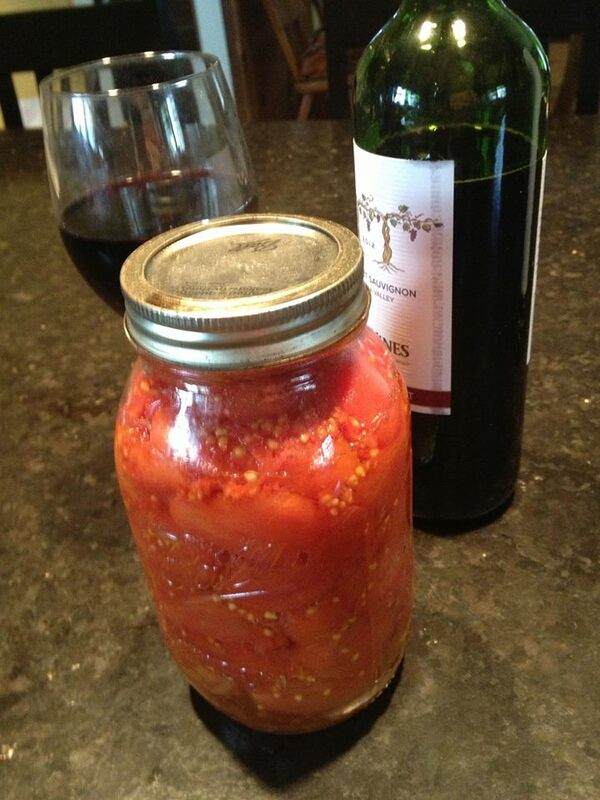 Put the top on your canning jar and tighten with your rim. 10. By now your lobster pot water is hopefully boiling. Remove the canning insert and fill with cans. Wearing your silicone gloves, lower the cans until submerged by boiling water, resting the rack against the edge of the pan. 11. Pay attention to when the water in the lobster pot begins to reboil. From the reboil, time 45 minutes for the whole tomatoes to heat through. 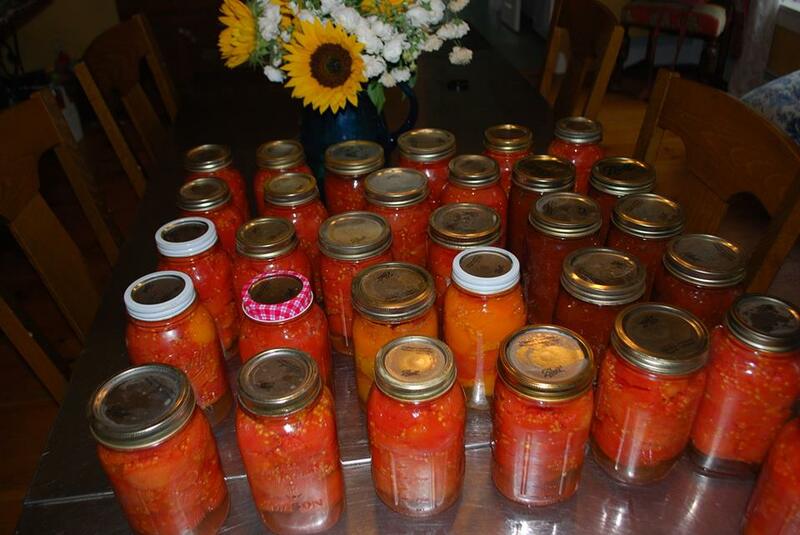 (If canning already prepared tomato sauce, heat up the sauce until uniformly warm, and follow steps 4, and 9-11). 12. Remove cans individually from the wire insert with silicone gloves (or tongs). Retighten tops and leave to cool on a counter top. You will hear a “pop!” as each individual can seals. This can take several hours. 13. Tap the lids of your cans. You ‘ll know that you have a good seal if you hear a “ping” instead of a “thud.” Don’t despair if you have a couple cans that still sound “thud” in comparison to the others after many hours of waiting (12 or more). These can go into your refrigerator for first use. 1. Drizzle garlic oil on peeled (or not–because they are organic, right?) carrots, a cut-up onion, and about 8 good cloves of garlic. Roast at 325 for about 45 minutes. 3. Puree roasted carrots, onion, and garlic in a food processor. 4. Combine peeled tomatoes, wine, herbs, and roasted vegetables in a crock pot. 5. Cook on low for 8 hours. 6. With sauce warmed through, can as described above. Or you can simply freeze your tomato sauce for later use. Thank you so much! Glad you found it.